Principle 1 (Overarching Principle): Intervening early in childhood can alter the life course trajectory in a positive direction (Kellam et al., 2008; Kitzman et al., 2010). Substance abuse and other problem behaviors that manifest during adolescence have their roots in the developmental changes that occur earlier—as far back as the prenatal period. While prevention can be effective at any age, it can have particularly strong effects when applied early in a person’s life, when development is most easily shaped and the child’s life is most easily set on a positive course. Principle 2: Intervening early in childhood can both increase protective factors and reduce risk factors (August et al., 2003; Catalano et al., 2003). Risk factors are qualities of children and their environments that place children at greater risk of later behavioral problems such as substance abuse; protective factors are qualities that promote successful coping and adaptation and thereby reduce those risks. All children have a mix of both. Interventions aim to shift the balance toward protective factors. Principle 3: Intervening early in childhood can have positive long-term effects (Degarmo et al., 2009; Shaw et al., 2006). Early childhood interventions focus on settings and behaviors that may not appear relevant for adjustment later in childhood or in adolescence, but they help set the stage for positive self-regulation and other protective factors that ultimately reduce the risk of drug use. 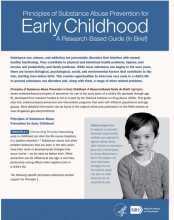 Principle 4: Intervening in early childhood can have effects on a wide array of behaviors (Beets et al., 2009; Hawkins et al., 2008; Snyder et al., 2010), even behaviors not specifically targeted by the intervention (Hawkins et al., 1999; Kellam et al., 2014; Lonczak et al., 2002). Because behaviors (both positive and negative) are linked to each other, risk factors for substance use may simultaneously put a child at risk for other problems such as mental illness or difficulties at school. This is why intervening to prevent one undesirable outcome may have a broad effect, improving the child’s life trajectory in multiple ways. Principle 5: Early childhood interventions can positively affect children’s biological functioning (Bruce et al., 2009; Fisher et al., 2007). The benefits of intervention are not limited to behavioral or psychological outcomes—research has shown they can also affect physical health. For example, one intervention for young children in the foster care system looked at cortisol level, a biological measure of the stress response. Over time, the stress response of children receiving the intervention showed better regulation and became similar to that of children in the general population. Principle 6: Early childhood prevention interventions should target the proximal environments of the child (Tolan et al., 2004; Webster-Stratton et al., 2008). The family environment is the most important context across all periods of early child development, and thus parents are a major target of many early childhood interventions (Dishion et al., 2008; Fisher et al., 2011). But as a child grows older, he or she typically spends more and more time out of the home, perhaps attending day care, then attending preschool followed by elementary school (Beets et al., 2009; Conduct Problems Prevention Research Group, 1999; Hawkins et al., 1999; Ialongo et al., 1999; Snyder et al., 2010). Interventions for different age groups and targeting different types of problems should focus on the most relevant context(s)—the home, school, day care, or a combination. Principle 7: Positively affecting a child’s behavior through early intervention can elicit positive behaviors in adult caregivers and in other children, improving the overall social environment (Fisher & Stoolmiller, 2008; Shaw et al., 2009). Behavioral changes in children and the adults who interact with them can be mutually self-reinforcing. Improving the child’s family or school environment can, over time, cause the child’s social behavior to become more positive and healthy (or pro-social); this, in turn, can elicit more positive interactions with others and improve the social environment as a result. Bruce J, McDermott J, Fisher P, Fox N. Using behavioral and electrophysiological measures to assess the effects of a preventive intervention: a preliminary study with preschool-aged foster children. Prev Sci. 2009;10(2):129140. Fisher PA, Stoolmiller M, Mannering AM, Takahasi A, Chamberlain P. Foster placement disruptions associated with problem behavior: mitigating a threshold effect. J Consult Clin Psychol. 2011;79(4):481-487. Kellam SG, Wang W, Mackenzie ACL. 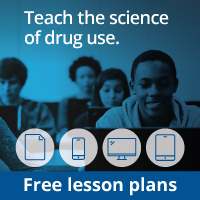 The impact of the Good Behavior Game, a universal classroom-based preventive intervention in first and second grades, on high-risk sexual behaviors and drug abuse and dependence disorders into young adulthood. Prev Sci. 2014;15(Suppl. 1):S6-S18.